Engagement session are always a great opportunity for me to spend some time with my couples, and get to know them a little bit. 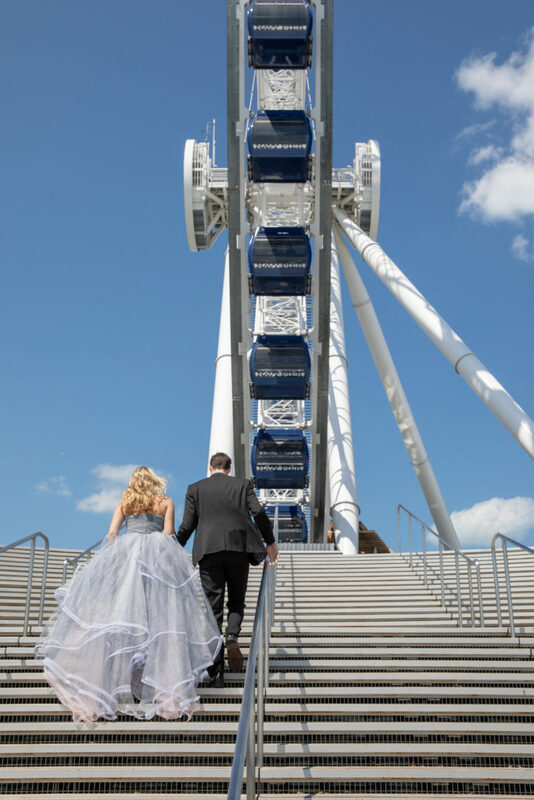 This is great for me, because the more I know about the people I photograph the easier it makes my job on the wedding day, and it also is great for my couples, so that they can learn a little bit about how i work, and what to expect on the wedding day. These kinds of photos are also just fun to have, caught at a moment in the lives of my couples before some really exciting things and big changes happen. I am a big fan of engagement sessions. Lately, my couples are bringing some serious creativity with locations, looks and requests and I LOVE that – it allows for their personalities really shine through. Molly and Taylor had their engagement session in downtown Chicago earlier this summer, and Molly was ready for it. Oscar De La Renta and Vintage Valentino from By Fashionholic made for one pretty awesome day of photography. Topped off by their chemistry, and a gorgeous Chicago day, it is one that I love! From the Gold Coast to Navy Pier, and a few random stops in between (like the entrance of a parking garage! ), we had a great time capturing these moments. I hope you enjoy them as much as I do!